We know that dinosaurs moved; they were vertebrates, and we have their trackways (sequences of footprints) preserved in certain sediments as fossils. One popular question is how fast did they move? Did some of them run as fast as the modern cheetah? Most scientists involved in the investigation of dinosaur locomotion think not. We have several lines of evidence that can help us estimate how dinosaurs could move. One line of evidence is the information given to us by those trackways. Two samples of the UCMP's large collection of theropod dinosaur footprints are shown at left; note the amazing similarity to the tracks of birds on a beach or muddy ground. We don't know of any giant birds that were around in the Mesozoic era, and no other vertebrates had feet quite like those of theropod dinosaurs, so we can be confident that these footprints were made by the carnivorous dinosaurs. 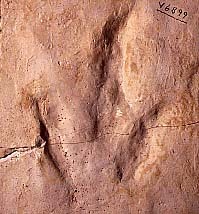 A good sequence of preserved footprints (called a trackway) can be extrapolated to give a rough estimate of how fast that particular animal was traveling at that moment. This method uses simple equations based on the distance between footfalls and the size of the feet. The fastest speeds evident from dinosaur tracks (a medium-sized theropod in this case) are about 12 meters per second (about 27 mph); a little faster than the best Olympic sprinters. Problem: It's hard to tell who made those tracks! We usually can narrow down our identification to large vs. small theropods, sauropods, or whatever. Then, knowing what sorts of those dinosaurs lived around there at the time the tracks were made, we can get ideas of who might have made those tracks. Then we have a shaky guess as to what dinosaur was moving at what speed at that instant. The obvious problem: "At that instant" is the key phrase; most animals are not running at top speed all of the time, especially when on soft ground, where tracks are most likely to be made. So we just have a glimpse into a brief moment in time; not a thorough analysis of dinosaur behavior. Good trackways are quite rare, too. But trackways are what we have to work with, so paleontologists must make do with that evidence. The morphology (shape and structure, or anatomy) of dinosaurs may be a more useful tool, but it is much more difficult to use properly. We can reconstruct dinosaur skeletons to figure out how the bones were connected, and make predictions about their functional morphology (how their bodies moved and worked) from muscle scars and other anatomical features. We have done that, and learned long ago that dinosaurs stood erect (like birds and most mammals); they did not keep their legs sprawling out to the side of their body like most lizards and salamanders do. Also, from the trackways of dinosaurs, we know that they rarely dragged their tail on the ground  normally, their vertebral column was oriented roughly horizontally with respect to the ground. So, mammals and birds are probably better models for understanding dinosaur locomotion than lizards are (but all are useful to some degree, and all are limited in their usefulness). Now it gets tricky! There are at least two ways we can go from here: one is to simply compare dinosaurs with extant (living) animals whose motion we understand better, and make assumptions based on the similarities and differences between the two. This can be called the morphological paradigm. The hadrosaurs and theropods had many members whose skeletal structure was similar to that of some modern cursors (animals that are good runners, like horses and ostriches): long legs, digitigrade stance (walking on one's toes), and so on. So we might think that some of those dinosaurs were “cursorial,” or specialized for locomotion, but because their locomotory features are not as specialized as those of many of the faster extant runners, we think that it is unlikely that any non-avian dinosaurs ran incredibly fast. Similarly, many sauropods, thyreophorans (armored dinosaurs), and ceratopsians were similar to modern graviportal (non-cursorial, heavily-built) animals like elephants, so paleontologists think that such large dinosaurs were less speedy. In general, big land animals use less strenous activities than their smaller relatives. A second direction we can take is more conclusive, but much harder. We can use the laws of physics and apply them to our dinosaurs; this is called biomechanics. We can "reconstruct" a dinosaur's muscles (using the musculature of the dinosaur's closest living relatives  the crocodilians and birds  as guides), estimate its weight, and apply established engineering principles to figure out how fast that particular dinosaur could move if it wanted to. Or so we think. The problem is that it is very hard to do this with any living animal! The difficulties are staggering when we try to do this with 65 million year old fossils (which are often incomplete). When you hear quotes about T.rex moving 40-60 mph, ask for the evidence and judge for yourself.